Adam is a prolific writer, hard-core outdoor enthusiast, and avid small-stream angler. Keeping things simple is paramount to Adam's fishing enjoyment. If you ever see him on his favorite small stream, you will find him wearing an eclectic collection of clothing, carrying a light-line fly rod and sporting only a small fly box, a spool of tippet, and a nipper around his neck. Try to obtain some of the dog food or pellet food mentioned above. Take the wine cork, and whittle a piece of it down to the size of the pellet. Cut a groove for the back of the hook. 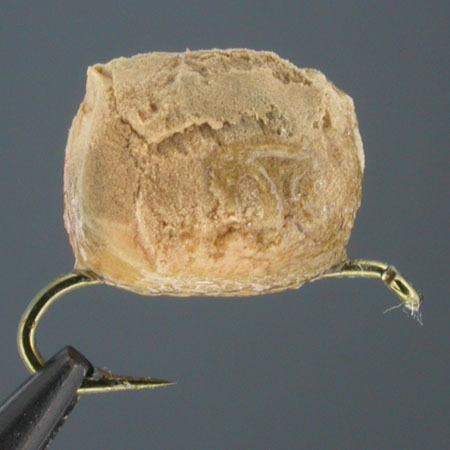 Now take a wet fly hook and super-glue the pellet imitation to the hook. Make a few of these and let dry overnight. Use a large fly rod line-weight, I use a six-weight. Floating line, and a 3-4x leader. Tie the "fly" to the tippet section. Don't forget your hook-removing pliers. Catfish photo courtesy of Adam Trahan. First get permission from the owner of the pond, and ask him when he feeds his fish. If you tell him that you are a "catch and release" fisherman, he will probably want you to keep the fish for him. Position yourself within casting distance from where he will throw the food. When the feeding frenzy begins, cast your offering to a small group of pellets. Your pellet will ride slightly higher in the water than the others and about half the time you will be able to see the take. If you can't see your pellet, just watch your line. 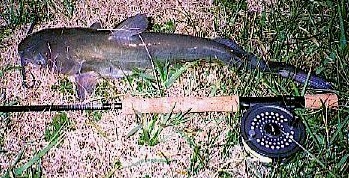 You will catch lots of catfish in the first few minutes. Most will be small at this time. Do not get discouraged if you don't catch a big one. The larger fish will wait till the food gets blown or drifted to the edge of the water. Then they will go about scooping large amounts of pellets from the edge of the pond. This is where it pays to be patient. 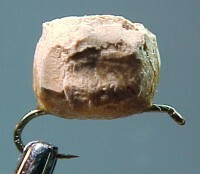 Cast to a large group of pellets and try to keep the leader hidden off the water onto the bank. More often than not, you will be rewarded with a large catfish fight. I have seen several selective feeding catfish avoid my pellet in a pile of fish food. I believe it was the lack of "smell". Take some pellets, crush them up, and add a little water to make a paste. Coat your pellet with this paste and let it dry. This will last only a couple of minutes in the water, so change pellets often if you are having trouble with educated catfish. Also, try the more expensive wine corks. They are of extra flora grade cork, and are a bit easier to shape. Feel free to e-mail me with any comments or questions. Wine cork, whittled to size and shape of food pellet (about 1/4" diameter) and super-glued onto hook.